Baby B Browne is a fabulous new tanning lotion on the market which offers more than just a pair of bronzed pins. Jammed pack with Aloe Vera, Seed Butter and Leaf Extract, this product will leave your skin feeling soothe and soft like a pair of silk pyjamas. Yes I did just say pyjamas (how indulgent of me!). What I particularly like about this product is its ‘body lotion’ feel, sometimes I prefer to use gradual self tanners to others because I feel that its lasting effect looks much more natural. The ‘B’ in Baby B Browne sure does mean brown! As you can see in the image below, the product itself is very dark. When you first see/use this product you instantly think that it is going to be too dark for your skin but have no fear ladies, this is one clever product. 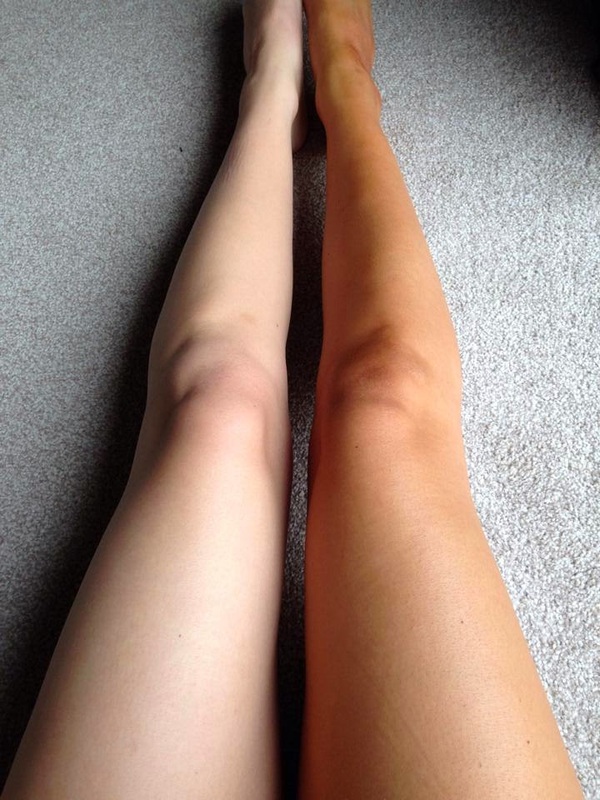 The tan only comes in one colour (medium) but the lotion is designed to react with each individual’s skin pigment to create a realistic looking tan that is specific to you. Unique and clever? I like. When you apply this product onto your skin I would highly recommend using a tanning mit because the tanning process starts instantly. After all, you don’t want a ‘Dorito hand’ do you. The smell of this tanning lotion is also like no other. Expecting a hint of Indian food, I was pleasantly surprised to get a waft of vanilla! I know ladies, is this for real? So whilst looking like chocolate and smelling like vanilla, this tan has GIRL written all over it. Definitely worth a try! I am totally in love with this tan. As you can see (below) there is a huge difference in colour (even when I first applied it I saw a huge difference!). The only critique I have of this product is its drying time after application- I feel like that you couldn’t put this product on in a rush. You are going to be stood like a starfish for a few more minutes than usual. Lastly, I would recommend showering off the excess (after the tan has developed) and not to sleep on light sheets (trust me I learnt the hard way). So whether you’re an English Rose or an Olive, this tanning lotion is perfect for any skin shade. You can buy this product for £14.95 at http://www.babybbrowne.co.uk/. Will you be keeping up your Summer tans this Autumn?